Periodontal disease (also known as periodontitis and gum disease) is a common inflammatory condition which affects both the supporting and surrounding soft tissues of the tooth and the jawbone. 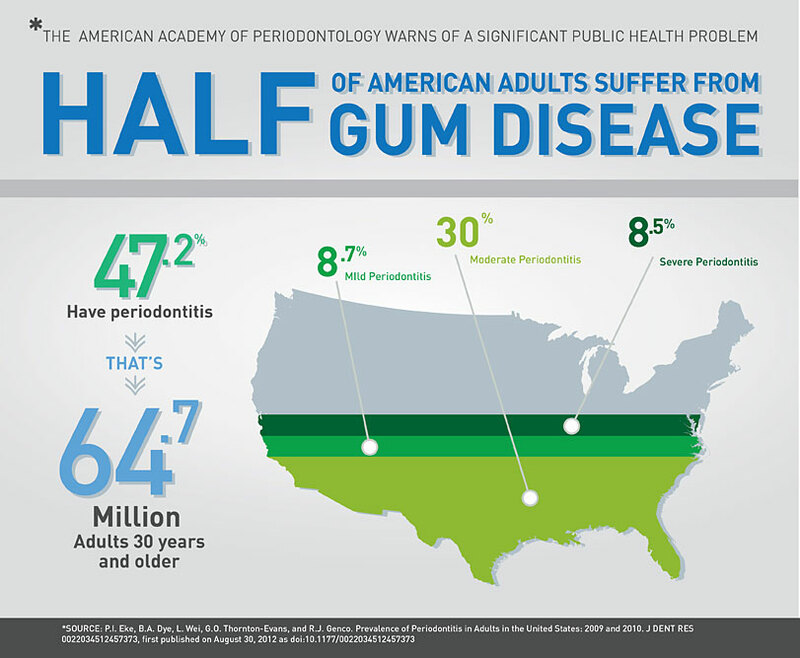 A 2012 study by the Centre for Disease Control and Prevention (CDC) found that one out of two Americans have some form of periodontal disease. Periodontal disease is usually preceded by gingivitis which is a bacterial infection of the gum tissue. A bacterial infection affects the gums when the toxins contained in plaque begin to irritate and inflame the gum tissues. Once this bacterial infection colonizes in the gum pockets between the teeth, it becomes much more difficult to remove and treat. Periodontal disease is a progressive condition that eventually leads to the destruction of the connective tissue and jawbone. If left untreated, it can lead to shifting teeth, loose teeth and eventually tooth loss.